Hi my loves! Hope all of you are well and happy. I'm presently blogging from my old room in Marikina, again. Heh. My life recently went into major changes, you know what I'm talking about friends. Heeh. I feel a bit lost but I know better days are coming, plus I have an amazing support group. Love you family and friends:) It's hard but I know it is for the best. Sometimes you have to lose something or someone to be able to find yourself and them again. Lakas maka So enough with the drama! Outfit photos taken a few days ago by my good friend Catch. Rooftop hits! I'll be honest, I'm not sure if this is an Efoxcity dress but I think it's from Efoxcity. Haha. You could actually wear this in 2 ways! You could wear it with out without the black lace overlay. Tama ba overlay? Haha. Basta! So dainty this dress noh so kyots. Anyway, got my Romwe package today! So many nice stuff it made my daaaay. Can't wait to show them to you! For now, bye bye muna. Have visitors in the house hihi. Catch up with you guys latuuur. Love you! Gorgeous as ever. Ganda ng dress and lace effect! *hugs* for what you're going through. Need ng girls night out toh! What a beautiful outfit! I can't stop staring at it! 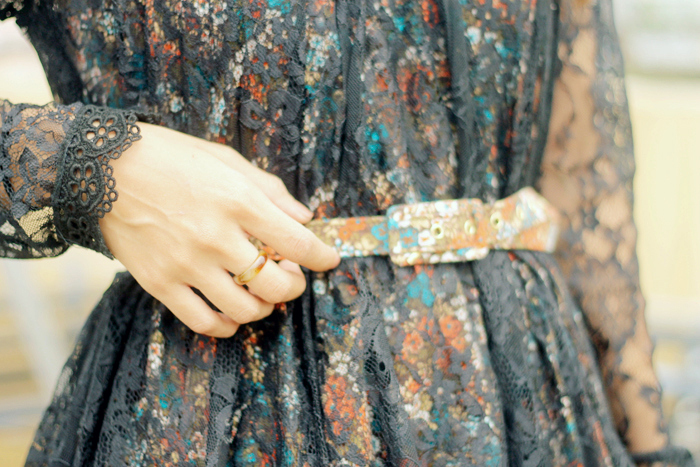 that dress is indeed so dainty thru the combination of black lace and the floral print underneath! the style is so unique!! and i really like the black and gold heels!! chic Ms.Ais!